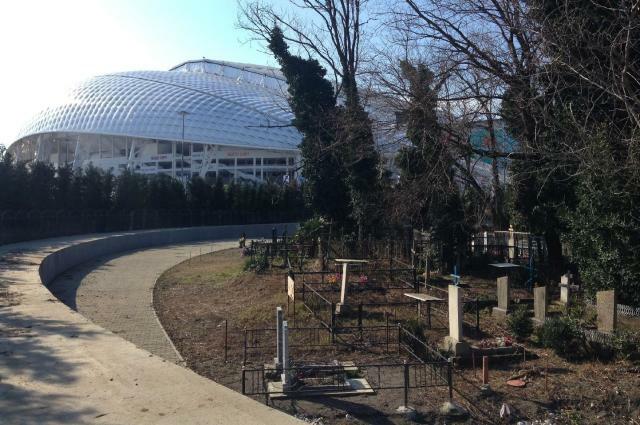 A look at some of the quirky (to put it politely) experiences that Sochi has served up to visitors so far, causing #SochiProblems to trend on Twitter. "No one is going to believe this but we just got stuck in an elevator. Ask @BOBSLEDR and @Crippsee who were there..."
This photo by Stacy St. Clair (@StacyStClair) went viral after she tweeted she was told by hotel staff not to use the water on her face "because it contains something very dangerous." "Water restored, sorta. On the bright side, I now know what very dangerous face water looks like. #Sochi #unfiltered"
Shaun Walker, @shaunwalker7: Sochi hotel not quite finished, & has no record of my reservation. I'll go to the bar while they try to sort it. Oh. Kevin Bishop, @bishopk: The reception of our hotel in #Sochi has no floor. But it does have this welcoming picture. Willie Geist, @WillieGeist: "The gold medal in Dream Haunting goes to this bark sculpture lurking under a tree inside the Athletes' Village." Jo-Ann Barnas, @JoAnnBarnas: Watch your step @Sochi2014 -- I've noticed on walkway and on sidewalks that not all man holes are always covered. Tamara Keith, @tamarakeithNPR: "Methinks the glue wasn't dry. Two bannister finials outside of the Rosa Khutor McDonald's hit the ground. #nprsochi"
Tamara Keith, @tamarakeithNPR: "Methinks the glue wasn't dry. Two banister finials outside of the Rosa Khutor McDonald's hit the ground. #nprsochi"
Joy Malbon, @JoyCTV: #Sochi Athletes Olympic Village what the Canadians see out their door. Brian Costa, @BrianCostaWSJ: "Do not be worried in case you hear sirens."